Last night was Halloween and for the first time in about 6 years I got to dress up. We decided to hang out with our good friends Claudia and Jimmy while they took Jimmy’s younger siblings out trick-or-treating. I had a costume that I bought 3 years ago from Hot Topic that I had yet to wear, so I was very excited to finally get my chance. 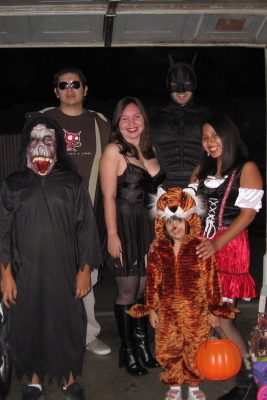 I bought Bryan a Dark Knight costume this year and I think he really enjoyed it. 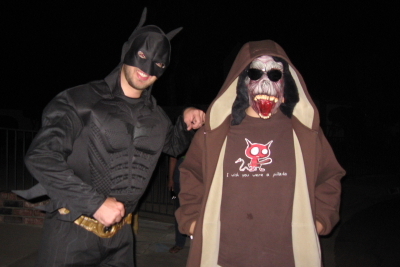 While trick-or-treating, he was constantly on the look out for trouble so that he might swoop in and save the day. We walked around a few blocks in Chino, there were a lot of nicely decorated houses, it’s always nice to see people in the Halloween spirit. I remember back in the day when I used to trick-or-treat the whole neighborhood would be decorated, it was like Christmas, but with monsters. We walked around for about an hour and then all went back to our place to watch Diary of the Dead, a great zombie movie by George A. Romero. 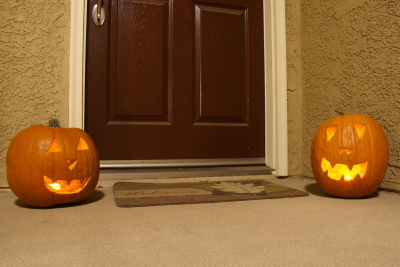 We even got a couple of trick-or-treaters at our condo! It was an awesome night and so much fun to dress up. Happy Halloween from Shez Photo!